As A Major Zoo Closes, 10 Reasons To Rethink The Concept : 13.7: Cosmos And Culture Are zoos really effective at education and conservation? Anthropologist Barbara J. 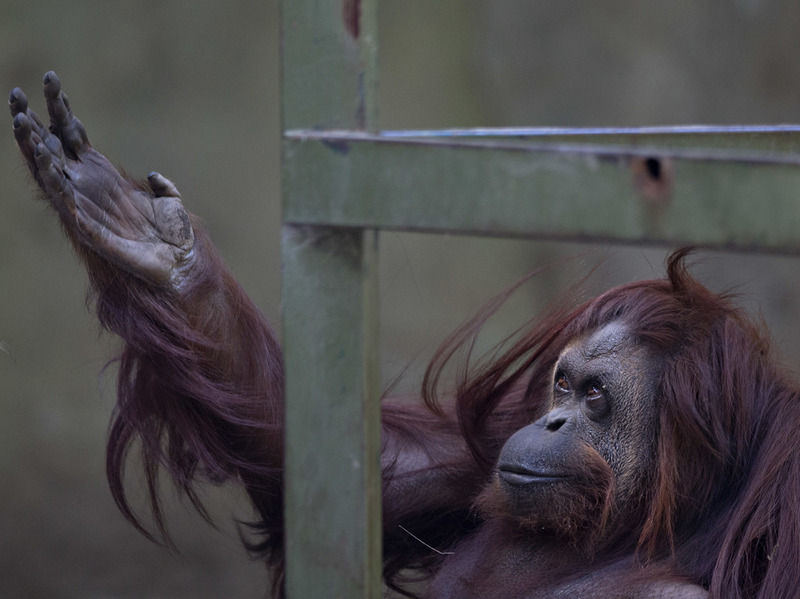 King offers her top reasons why it's time to rethink the role of zoos. In this Dec. 22, 2014, file photo, Sandra the orangutan sits in her enclosure at Buenos Aires Zoo in Argentina. After 140 years in operation, the Buenos Aires Zoo in Argentina's capital plans to move almost all of its 2,500 animals to natural reserves. Those animals too old or infirm to make the move will stay, but will no longer be kept on public exhibit. The zoo will become an educational eco-park where animals rescued from the illegal-trafficking trade may be helped and housed. According to The Guardian, Horacio Rodríguez Larreta, the mayor of Buenos Aires, said in announcing this news on Thursday: "This situation of captivity is degrading for the animals, it's not the way to take care of them." Good news like this brings with it an exhilarating surge of humanity and hope. Just last week, the National Aquarium in Baltimore announced plans to move its eight Atlantic bottlenose dolphins to an outdoor sanctuary — one with natural seawater — by 2020. That decision as well was driven by animal-welfare concerns. An information fact sheet provided by the organization In Defense of Animals (IDA) reports that since 1991, 27 zoos have closed or will be closing their elephant exhibits; 13 zoos have sent elephants to the two elephant sanctuaries in the United States, one in California and one in Tennessee. This change comes in recognition, the IDA says, "that a traditional zoo cannot meet elephants' needs for space for movement and health maintenance, mental stimulation, and large social groups." I don't mean to suggest that zoos or the exhibiting of animals on public display is on the way out. David Grazian's 2015 book American Zoo: A Sociological Safari reports that (as of 2014) 181 million people visit U.S. accredited zoos each year, where 6,000 species and 751,931 individual animals are held. As in this case of the scimitar-horned oryx involving the Smithsonian Conservation Biology Institute, conservation programs at zoos sometimes truly help animals on the verge of extinction. Yet releasing animals back into the wild from captivity can be very risky, depending on the species and the location in question. Such projects must be undertaken with great care, using the best-known ecological principles; otherwise, as in this case with gorillas, the outcome may be tragic. It's beyond dispute, though, that times are changing for zoos. Tuesday, on NPR's Diane Rehm Show, I discussed the costs and benefits, and ethics, of zoos with guest host Tom Gjelten, National Zoological Park Director Dennis Kelly and The New York Times's Dot Earth blogger Andrew Revkin. As I hope I conveyed in that discussion, I have great respect for zoo biologists, keepers and other staff who work tirelessly for the good of the confined animals in their care; my argument is not with these individuals but with zoos as institutions. 10. A stamp of approval ("an accredited zoo") from the AZA (the Association of Zoos and Aquariums) is touted as a benchmark of quality. Yet the for-profit facility SeaWorld Orlando is an AZA-accredited zoo, even as its cetaceans are still made to perform for the public. 9. Many more unaccredited zoos and roadside attractions featuring animals exist in the U.S. than do accredited zoos; at these, standards of care are often minimal. Big cats, including tigers, are among the victims. 8. In a recent blog post, the Wild Cat Conservation Legal Aid Society notes striking results of its survey: Many zoo visitors rush from one exhibit to the next and most report not having learned anything at the zoo that they didn't already know. Critics — see this and this — have pointed out serious methodological flaws in studies that claim to show that zoos successfully educate visitors on important animal-related and conservation issues. 7. Accidents happen way too often at zoos. Just last week at the Oregon Zoo, the lion Zawadi had the tip of his tail cut off by a hydraulic door. A 16-month-old gorilla at the San Francisco Zoo was less fortunate; in 2014 she was crushed to death when a hydraulic door closed on her. Other examples abound. 6. If there's an animal escape or a breaching of an animal enclosure, the animal often pays with its life. Harambe the gorilla at the Cincinnati Zoo is only the most recent example. I won't second-guess the need to kill Harambe to protect a child; as Marc Bekoff has noted, the question is why Harambe was in a zoo in the first place. In Europe, animals may pay with their lives simply for being regarded as "surplus" animals in the absence of birth control programs. 5. Arguments that zoos create empathy on the part of visitors for animals, but visitors aren't seeing natural behavior. Though enrichment activities may exist for predators to experience aspects of hunting, predators' behaviors are often sanitized when animals are in the public eye. 4. A substantial percentage of zoo visitors may taunt animals in their enclosures. Of course, people's behavior with wildlife is no model of ethical responsibility either, but confined animals may have fewer ways to flee human harassment. 3. Entertainment offered to zoo visitors often comes at the expense of the animals' calm, privacy and safety. During one of the London Zoo's past Friday night parties, a man poured beer on a tiger. Grazian in his book American Zoo describes being invited to feed and pet four dolphins at Sea World-San Diego when in 2011 he paid for the special Interactive Spotlight Tour there. A more expensive package was also available, through which could have swum with the dolphins. 2. Animals, contrary to what we often may hear, are sometimes brought to zoos from the wild. In March, 17 elephants were flown from Swaziland to three U.S. zoos. 1. Huge sums of money-- $56 million for the National Zoo's Elephant Trail exhibits and $30 million for Detroit Zoo's penguin conservation center to take two recent examples — could be put directly into wildlife conservation, or used to settle animals in sanctuaries. Funding is a key and difficult issue in rethinking zoos. Only when we look squarely at the problems with zoos will we begin to find plausible funding solutions. If we stop breeding animals simply to restock zoo exhibits in a perpetual cycle, and if we stop building new multi-million dollar zoo exhibits, we can make a start. We can tip the ratio of zoos and sanctuaries in the direction of sanctuaries, where animals' lives come first, over and above human entertainment. Barbara J. King is an emerita anthropology professor at the College of William and Mary. She often writes about the cognition, emotion and welfare of animals, and about biological anthropology, human evolution and gender issues. Barbara's most recent book on animals is titled How Animals Grieve and her forthcoming book is Personalities on the Plate: The Lives and Minds of Animals We Eat. You can keep up with what she is thinking on Twitter: @bjkingape.